In the 1950s and ’60s, there was no better ambassador for Shreveport in baseball than Fred Melvin McGaha. Mel went from outstanding three-sport athlete at the University of Arkansas to pro baseball and basketball player, college basketball coach, minor-league player-manager and then, in the 1960s, major-league manager and coach. And starting in 1953, for three-plus decades, a Shreveport resident with his family. His first team (’54) won Shreveport’s first Texas League regular-season championship; his second won the TL playoff championship and played in the Dixie Series. He was a teacher of the game’s fundamentals — many times in youth clinics in Shreveport and North Louisiana — and a solid strategist, with a direct, honest and, at times, forceful personality. “I can’t say enough good things about Mel, I thought the world of him,” said good friend and golfing buddy Billy Muffett in a 2002 interview. Muffett pitched for McGaha and the Sports in 1955, including a no-hitter in the playoffs, and went on to pitch in the majors and was a longtime MLB pitching coach. J.W. Jones was a Sports catcher through most of the 1950s and also stayed in the city as a resident, and he, too, had “high regard” for McGaha. The 1956 and 1957 Sports teams did not compete for playoff spots, although the ’56 team featured the Texas League home-run record breaker, Ken Guettler, with 62 homers. After the ’57 season, the Shreveport franchise folded and Mel moved to the Southern Association to manage Mobiel, Ala., in 1958-59. He managed minor-league championship teams in 1959 (Mobile) and 1960 (Toronto Maple Leafs, International League), then became a major-league coach (Cleveland Indians) in 1961. His first major-league manager’s job was with Cleveland in 1962; he was fired after a 78-82 record and sixth-place finish. He moved on as a coach and off-season front-office aide with the Kansas City Athletics, and in the middle of the 1964 season, he was first sent to the front office by notorious team owner Charlie Finley and then quickly made the field manager of a last-place team. He was fired by Finley (no unique happening) after a 5-21 start in 1965. His MLB managerial record: 123-173. He then managed in the Houston Astros’ system at Oklahoma City (Class AAA) in 1966 and ’67, and in a Shreveport connection, became first-base coach for the 1968-69 Astros while fellow Shreveport resident and ex-Sports manager Salty Parker was the third-base coach. A Louisiana native (born in Bastrop in 1926), McGaha grew up in Mabelvale, Ark. (Pulaski County), a town later annexed into Little Rock. He did not play football in high school, but after starring in basketball and baseball, went out at University of Arkansas and made the team as an end. Solidly built at 6-foot-2, 198 pounds, he became a three-sport star for the Razorbacks from 1943 to 1948 (one year, 1945, he spent in military service). He played for Arkansas in the Cotton Bowl at the end of the 1946 season — the “blizzard” 0-0 tie with LSU — and in the Dixie Bowl in 1947 when he ran back a pass interception 72 yards for a touchdown. In 1970, he was inducted into the Arkansas Sports Hall of Fame. An outfielder-catcher in high school and outfielder-first baseman at Arkansas, he signed a pro ball contract with the St. Louis Cardinals in 1948. He also stayed with basketball and in the 1948-49 season played in the pros — NBA — appearing in 51 games as a reserve guard with the New York Knickerbockers (averaged 3.5 points a game). In his first pro baseball season, he was with the Duluth Dukes (Northwest League) when the team bus collided head-on with a truck, Six team members were killed and McGaha was one of 13 injured. He recovered, but the injuries — mostly a weakened shoulder — limited his playing ability and he never made the majors as a player. Still, he played 11 minor-league seasons and was a versatile performer — outfielder, first baseman, sometimes shortstop and even a pitcher. He was a dependable, often clutch, pinch-hitter. He reached Class AAA with Columbus in 1949 and ’50, then spent the bulk of his career in the Texas League (two games with Houston in ’48, then full seasons with the Buffs in 1950-52 before five years with the Sports). He was a .277 hitter in 903 regular-season minor-league games, with a best of .326 for the 1956 Sports. His Shreveport regular-season totals: 438 games, .274 average, 48 doubles, four triples, 32 home runs, 181 RBI. At one point, he was a volunteer assistant coach with Arkansas basketball and at the start of his Shreveport career, he was head basketball coach for two seasons at Arkansas-Monticello (the Boll Weevils). “Basketball was his first love,” said son Fred — who played baseball at Shreveport’s Fair Park High and then at Louisiana Tech (where he was a conference batting champion), signed a pro contract (Cardinals’ chain, 1972-73) and wound up briefly playing outfield for the ’74 Shreveport Captains. He is a longtime attorney in Monroe, La. 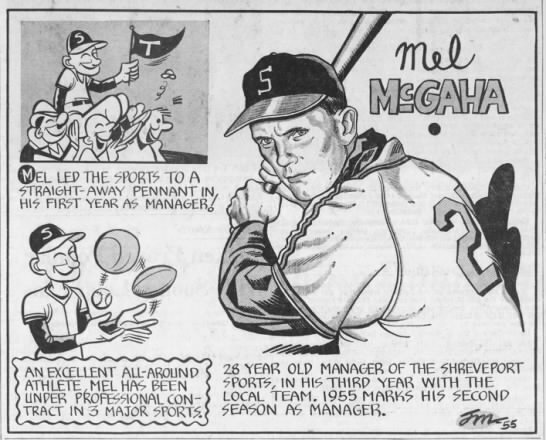 After leaving pro ball after the 1969 season, Mel become director of SPAR (the Shreveport Parks and Recreation department) through the mid-1970s, then moved across the river to head the recreation department in Bossier City. All the while, he remained involved in pro baseball — with the Shreveport Braves and then the Shreveport Captains as an advisor to team officials and with public relations. In helping then-Captains owner Ray Johnston in the early 1970s, he lobbied for a new stadium in the city. That did not materialize then, but McGaha remained connected to Shreveport’s team. “He was as supportive of me as anyone in town,” said Taylor Moore, Captains’ team president and operating partner for more than 20 years. “He was more helpful than most anyone knew. Fred McGaha, of course, was connected to baseball from his early days. “When we were kids,” he recalled of him and his older sister, “he [Mel] was not home a lot of the year. But when school was out, we would go to where he was [managing or coaching]. And Mel, the tough baseball man, was not a tough father. In the early 1980s, Mel — remarried after his first wife Tina’s death — moved to Disney, Okla. He died Feb. 3, 2002, in Tulsa at age 75.